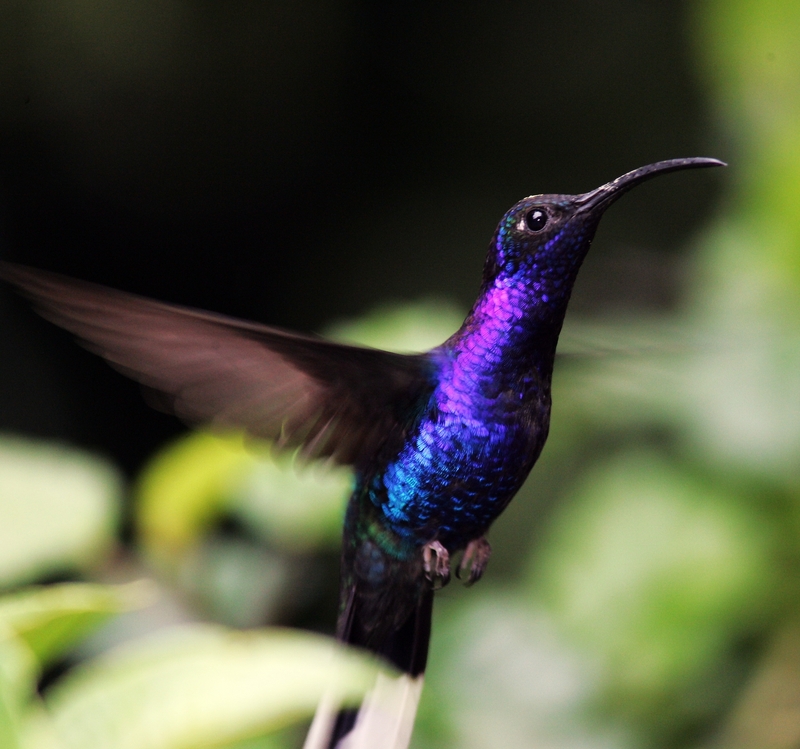 Costa Rica is the best place to see topical birds in Central and South America.It´s a small and developed country. Infrastructures are quite good and safety is good. It hosts almost 900 species and 26 national parks that covers an important area of the country.You can find many interesting birds as Macaws, Toucans, Toucanets, Cotingas, Manakins, Trogons, Hummingbirds, Motmots, Jacamars, Tinamous, Antpittas, Antbirds, Antthrushes, Vireos, Potoos, Tyranulets, Oropendolas and the bizarre Bellbirds. Some macaws are easy to see in some farms and near houses but many of them are endangered species. The Scarlet Macaw is common in the nearbies of some cottages,but its habitat is very fragmented. Hummingbirds are plentiful all over the country and trogons are relatively easy to spot in some forest areas. 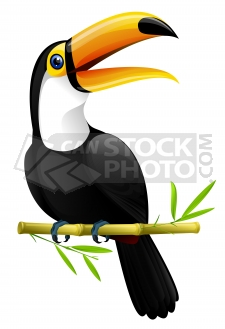 Big tucans usually perches on quite far branches on the top of the trees. 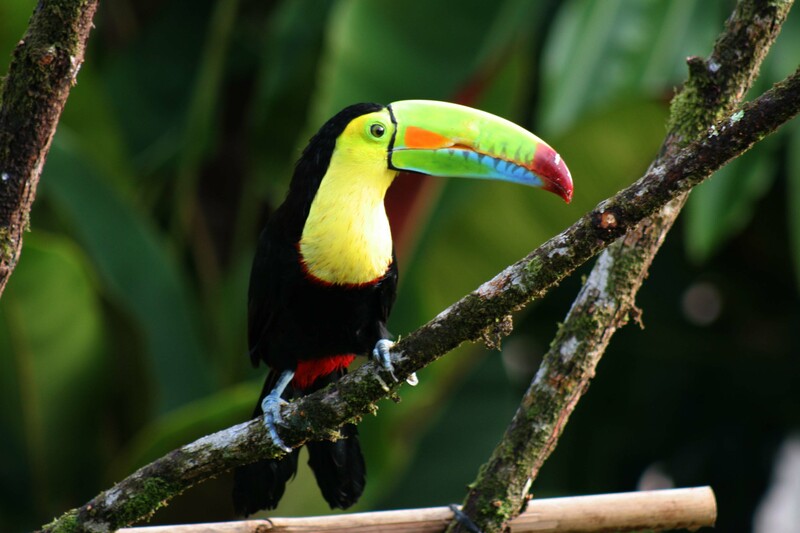 However, the Keel-Billed Toucan, is common from sea level to 1200 meters and easy to watch. 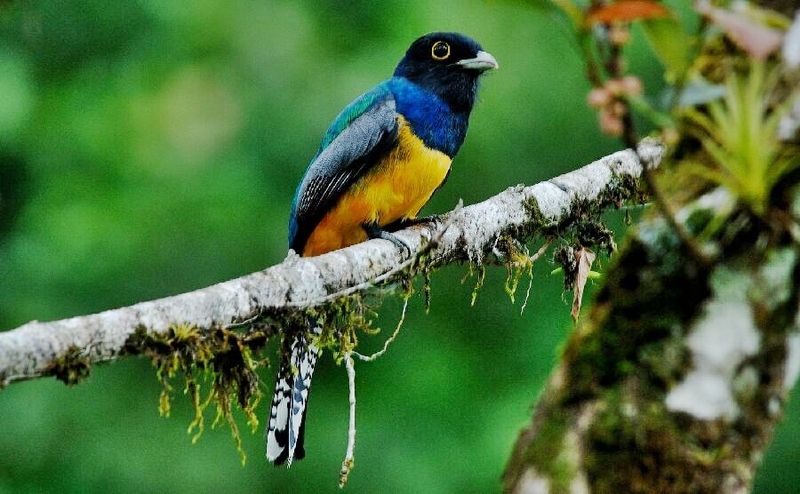 Grey and Blue Tanager and Scarlet Rumped Tanager are common birds frequently seen all around Costa Rica. Poas Volcano National Park was the first national park that i visted in Costa Rica.It´s only at one hour by bus from San Jose.This volcano has a sulfurous water lake at the crater.When you walk until the top you can find some birds close to this area.Hummingbirds are common there and the Violet Sabrewing , is one of the most beautiful birds to see and the largest hummingird in Costa Rica.Scarlet-rumped Tanager were following all the way. Braulio Carillo National Park is one of the nearest national park from the capital, San Jose.This park is relatively untravelled.More tha 530 species of birds inhabit in this excellent and well preserved primary forest.There are several species of hummingbirds, and you can find many interesting birds as the Solitary Eagle,Bare-necked Umbrella Bird,and the Black -headed Bushmaster.The Violaceous Trogon is a common bird around this area. La Estación Biologica de la Selva is the main station of this National Park.You can walk through many trails that are in the surroundings and some birds are easy to spot at certain hours.Guides are available and recommended to have an introduction to the wildlife of the area. Manuel Antonio National Park is the most famous national park in Costa Rica.It´ s located on the Pacific coast of Costa Rica and its view is stunning with beautiul beaches to enjoy. It hosts 184 species of birds and 109 species of mammals.Monkeys are very common there: White-headed Capuchin Monkey, Squirel Monkey ( a very cute monkey that sometimes appear near hotels in the afternoon ), Mantled Howler Monkey ( that make you wake up every morning with its noisy call ) as well as coatis,iguanas, snakes, and bats.I recommend you to bring protected shoes to avoid snake bites ! Rincon de la Vieja National Park is a quiet and beautiful national park where you can enjoy of its hotsprings, waterfalls and fumaroles or climbing to the top to see the crater of the volcano. 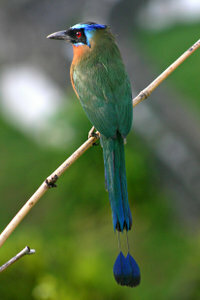 It´ s located in the dry area of Guanacaste province,and it s one of the best national parks for birdwatching,with 260 species of birds.Blue-crowned Motmot, as shown below, is easy to see and coatis are always near the park station. Other birds that you can see as well are Toucans, Esmerald Toucanet, White fronted Parrots,Red trogons, Curasows, Laughing Falcons, Espectacled Owls,Blue throated Goldentails, Montezuma Oropendolas, Black face Solitaire,Three Wattled BellBirds, Eagles, Tanagers, Flycatchers, Chorchines, and Manakins. 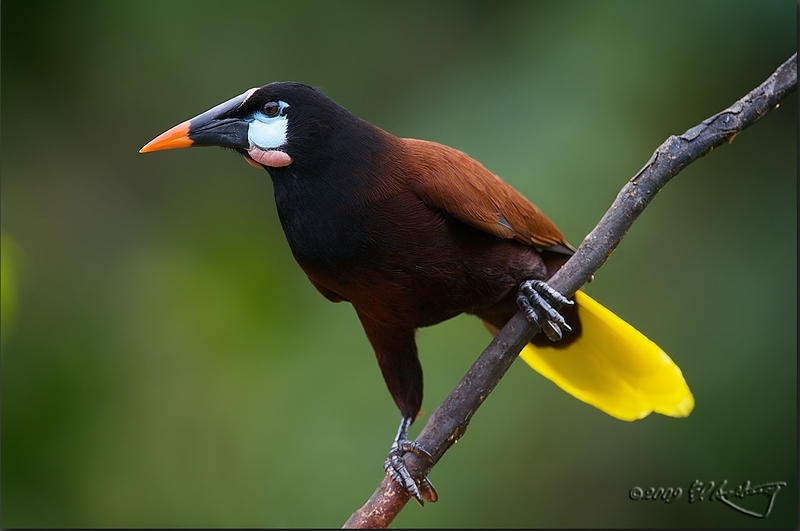 The Montezuma Oropendola is a quite common bird,wich builds its typical nests hanging on trees. Monteverde Forest Reserve is my favourite wild area. It s a montaneous cloud forest with more than 400 species of birds. 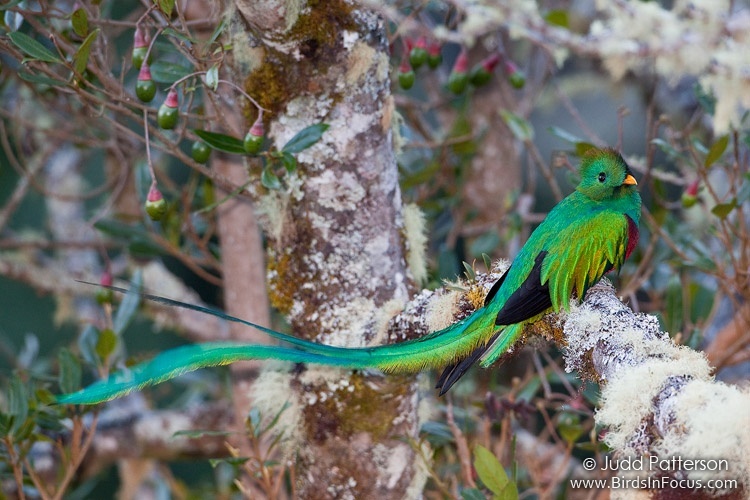 The star bird is the Resplendent Quetzal , seen in the picture . After many times tying to located it i could find a nest and after waiting for it long time,it appeared with its long and beautiful tail.It was a shocking experience for me that i still remember with joy.Its beauty is indescribably,as shown below, with a red chest and green on the rest,that changes on the back, and i was lucky enough to spot the male and the female !!! However,there are other interesting birds that are easy to spot.The Three-Watlled Bellbird is common there, and it s more often hear than seen.Its calls sound metallic and sometimes it perches on dead branches.I could hear and after locate one of this birds on a exposed branch,on the top of a tree. 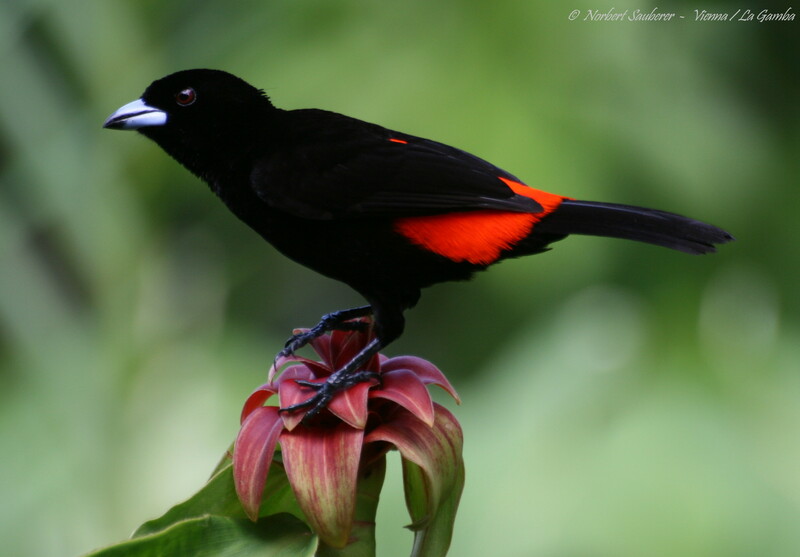 Tortuguero National Park and Cahuita National Park are other excellent national parks for birdwatching. Tortuguero is very interesting if you want to see how turtles lay eggs on the beach at night.Cahuita is near Puerto Limon, on the Caribean side, and it hosts many kinds of monkeys too. Corcovado National Park , on the souhwest of Costa Rica is the most inaccesible national park.The park includes a large lowland tropical rainforest and it s the largest primary forest on the Pacific side. It ´s very rich in fauna and flora and if you are lucky you can meet a Jaguar,Ocelot,Margay, Bair´s Tapir,a Northern Tamandua, or a Silky Anteater. Scarlet macaws and Pelicans are common near the coast line.Interesting birds are Black-cheeked Ant-Tanager, Baird’s Trogon, White-tipped Sicklebill, Band-tailed Barbthroat, Turquoise Cotinga, Yellow-billed Cotinga, White-crested Coquette, Marbled Wood-Quail, Charming Hummingbird, Mangrove Hummingbird, Golden-naped Woodpecker, Red-rumped Woodpecker, Black-hooded Antshrike, Pearl Kite, King Vulture and Red- throated Caracara. I still regret not seeing one of this amazing birds that there should be in everyone birdwatcher´s list, the Long Tailed Manakin. The males usually sing in duo to attract females and after they display a funny and complex courtship dance. 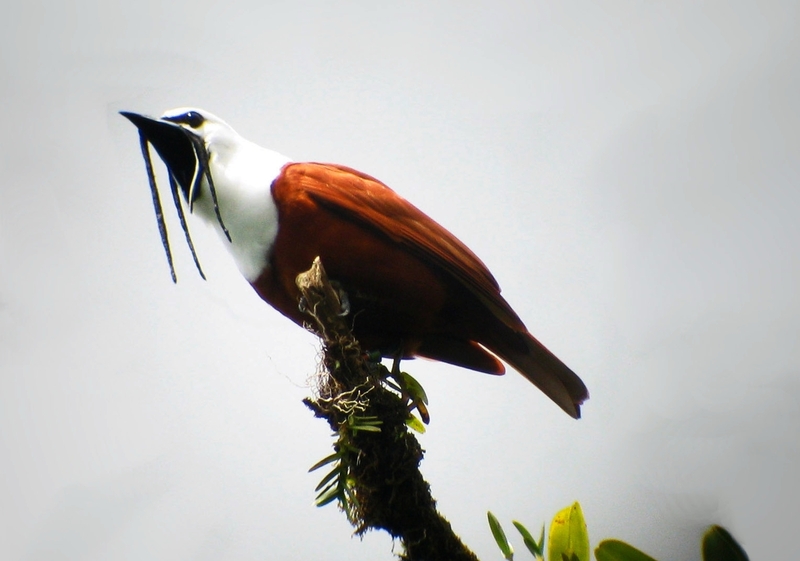 It was my first experience as a birdwatcher in a tropical country.I enjoyed a lot discovering the amazing wildlife that inhabit there.I still remember the great places that i visited there and I want to come back again some day !!! Maybe soon ?